Where does the boundary between the physical and spiritual world lie? To listen to most folks, they consider "Heaven" as some distant place we go to after death, a place where Christ Jesus and God reside, as if it were a place like Washington, D. C. or Paris, France, where we must be transported to in order to arrive. It is easy to consider the boundary between where we are now and Washington or Paris, but where is the boundary between us and the spiritual world? Steiner tells us bluntly, "The boundary really lies right in the middle of the human being." [page 1] Precisely this is important for understanding the world: the boundary between the physical world and the spiritual world is found within the human being. I have often pointed out, from the view point of spiritual science, the great importance of natural-scientific methods of thinking both for the present and for the future; but this scientific thought really stands more or less where it has always stood from its beginnings. You could well say that it is actually suited for spreading darkness over certain important truths of life. As student of physics, I was immersed for decades in scientific thought, and it chagrins me to find that I was involved in the process of spreading a blackberry jelly over the white bread of truth and then proudly proclaiming that the truth I have covered up doesn't exist because I cannot see it! This is a silly metaphor, but if you will read how natural scientific thought has covered up the existence of the spiritual world by dividing our perceptive capabilities into sensory and motor neurons, suddenly you may recover the truth lying under the "darkness spread" we have covered it with(1). In Oliver Sacks' book, "A Leg to Stand On", we have a first-hand report by neurologist Sacks about his mountain-climbing accident in which he nearly lost a leg. He makes it perfectly clear that during the time he was hospitalized that he could not perceive the existence of his leg which lay motionless on the bed still connected to him. He didn't even believe it was his leg. Clearly no perceptions of his leg were being transmitted to him, and without those perceptions, his will was unable to move the leg. Yet, the surgeons and neurophysiologists attending him claimed it was the lack of motor neurons which kept him from moving his leg. This claim about so-called motor neurons is what Steiner calls the darkness spread over the truth above. Another example which may help you to understand how important perception is to moving one's limbs. In this example, you will have to agree that one is just barely able to perceive one's leg and just barely able to move it, but yet the motor nerves are present and functioning. The example I'm thinking of is when one's leg goes to sleep (becomes numb from sitting on it perhaps). Slowly as one recovers the normal feeling in one's leg, one recovers the ability to move it normally. The importance of this observation is that it shows that ability to move recovers in complete synchrony with the ability to perceive the impaired limb. These two examples show the difficulty that neurophysiologists have in understanding the boundary between the physical and the spiritual world: they cover it up with an arbitrary distinction by postulating the existence of sensory and motor neurons. If that distinction is appropriate, those who hold to it should be able to provide an example which motor neurons can be fired off to move a limb for which no sensory neurons are providing evidence of its existence. They simply say, "Sacks can't move his leg because the motor neurons are injured." They make a distinction where none exists and never have to prove it — that is an effective way of spreading darkness over the truth. In the middle of the human being is the will through which we make decisions to move our limbs. Our will exists as a spiritual entity of which we are not aware, but through which we move about in the world. When the sensory information arrives of the existence of a leg, our will can cause it to move and receive sensory information about its movement. Our will lies at the boundary between the spiritual world and physical world and in the middle of the human being. When one understands this, the need for the arbitrary distinction of sensory and motor neurons disappears, and "one sees rightly what is essential is invisible to the eye" as the Fox explained to the Little Prince. Natural scientists since the fifteenth century have mostly stumbled around in a world in which they strive to explain the visible world without a need for postulating an invisible or spiritual world. When they reached, in the past hundred years, the realm of quantum physics, suddenly their explanations no longer made sense. Physicists had discovered the boundary of the spiritual and physical world in their examinations of the microscopic world of quantum effects with their macroscopic measuring equipment(2). The following poem ties together the human will and quantum particle which both provide insolvable conundrums for natural scientists, up until now. on the physical side of the fence. at the far end of the universe. I do not pretend to understand fully this mystery of will, quantum particles, the physical world, and spiritual world, but there is a relationship which is not one of here and there, where Earth is here and Heaven is there — someplace else. It is all here and all interwoven, in our nerves, and in the quantum particles which make up our nerves and tissue. The first lecture deserves your study, dear Reader, as it contains more details than I can share in a brief review, details(3) which will reward your study. One would do well to study what Steiner says about the difference between ideas and reality. He presages what Alfred Korzybski later said about maps and the territory, "The map is not the territory; it cannot represent all of the territory." Thus, anyone who deals in maps or ideas must necessarily be limited to a one-sided view of a multi-ordinal reality. [page 21] The difference lies in whether people start from the reality or from ideas. If they start from ideas, they will always be one-sided. But when they try to take reality as their starting point — since they can only bring forth ideas and nothing else, and every idea is one-sided — they must produce one-sided ideas; that is quite obvious. Thus, you see that a complete, deep-reaching change of the soul life is essential. For this reason, it is not difficult at all to criticize many ideas I bring. I do not know if anyone would have hit upon this particular criticism, but I already think of everything that needs to be criticized myself. We must be conscious of how the idea is related to reality. Only then shall we be able to penetrate into reality. Otherwise, we shall always quarrel about ideas. Today the whole world is fighting about ideas in the social sphere, although as frequently happens, this fight has been transformed into external deeds. These things lead into the intimacies of the spiritual life. Those who want to understand existence must reflect on such things. Before I began studying Rudolf Steiner, I was unaware of my feelings — I felt things, but never considered those feelings to be important or worthy of talking or writing about. To me as a physicist, only thoughts and ideas were worthy of discussion, not feelings. I recall reading James Boyd White's book, When Words Lose Their Meanings, and discovering that meaning amounted to a lot more than thoughts and ideas, meaning also included feelings. In the Index of that book, there are several dozen references to Emma, a novel by Jane Austen. Since I had never read Jane Austen's works before, I bought a copy of this novel and was amazed to find the author writing about people's feelings in a way that I might have written about ideas or thoughts. It was my first awareness of feelings and yet that awareness still existed as a thought or idea. Several years later I began studying Rudolf Steiner's works and came to understand that feelings are a conduit through which spiritual realities come to us, even to those who have no other direct perceptions of the spiritual world, which includes most people in the world today. We are conscious of our feelings, but not of their deeper meaning as part of our reality. [page 23] From the moment we awaken in the morning until the moment we fall asleep, we are truly awake only in our sense impressions and in our thinking. We are not fully awake in our feeling life. And there lies the threshold, practically unnoticed by everyday consciousness, between the thought life and the feeling life. For we are not conscious at all of what penetrates our feeling life as a deeper reality. We are conscious of the feelings themselves. They surge up out of a subconscious world, but we are conscious of them no more than we are of our dreams when we are asleep. 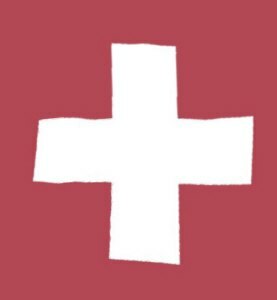 As I said recently here in Switzerland in public lectures: while we live in our feeling life, we are actually asleep and dreaming. The dream life extends itself over into our waking life. We are really in a continuous dream state from the moment of going to sleep to that of awakening, but we are only conscious of those dreams that are most strongly connected with our physical existence. Only in the deeper layers of our consciousness do we sleep, so to say, dreamlessly. But this dreaming and dreamless sleep life goes over into our feeling life, into the life of our emotions. And we know no more of the reality, of the actual content of the ordinary consciousness of our feeling life, than we know of what actually occurs when we dream at night. [page 23, 24] Therefore we could also say in these lectures that the human being does not inwardly experience the content of what is called "history" with waking consciousness, but dreams through it. History is a cosmic dream of the human being, for the impulses living in history actually live in feeling and emotional impulses. We dream while we experience history. Thus the life of feeling lies beneath the threshold of the actual waking consciousness. Just as Steiner said on page 1 that "the boundary between the physical world and the spiritual world is found within the human being," so too is it true that, because we are not conscious of the spiritual, "the boundary between the conscious and the subconscious life goes through the middle of the human being." (Page 24) We are conscious of things after they happen, even though our will was responsible for what happened. Knowing is a process of sensory perception, and it requires a finite time for that sensory perception to reach us and become processed before we know of its existence. In addition we are asleep in the execution of our will which precedes the action which triggers the sensory perception. These are several of the ways in which my Matherne's Rule #8, "It always happens before you know it" applies. The unconscious process of will was unknown to me when I formulated the rule, but it is part of the process which happens before we know it. [page 24] In our will life we are completely asleep, for we know nothing about what actually lives in the will with our everyday consciousness. Our ordinary consciousness perceives the reality of the will in exactly the same way that it lives in deep sleep. We follow consciously only what comes out of the will and has already gone over into action. In this action we awaken; in the execution of the will we cannot awaken. Hence philosophers continually quarrel about the freedom and the non-freedom of the will, because they cannot penetrate into the realm from which the will really draws its impulses, which can be seen only with clairvoyant consciousness(4). Thus — I accentuate it once more — also in the soul connection, the world that remains lies in the middle of the human being. How can what I experienced before birth or in a previous incarnation or those friends and relatives who have died during my current lifetime have any effect upon me in my life today? Perhaps that thought has occurred to you, dear Reader. Note your presupposition that if those things had an effect upon your life that you would be conscious of that effect in your thoughts. But the information does not reach you directly as thoughts but instead as feelings and will-initiated actions. Thus, you are unaware of those things in operation in your life because they affect your feeling and will and most people react automatically to their feeling and their will — which both operate outside of their consciousness. It is a portion of life that most people sleepwalk through, i. e., without consciousness. [page 24] Now everything we experience between death and a new birth plays right into our life of the feeling and the will; that is, into what we sleep and dream through. The experiences of the dead are actually in the world where we live in feeling and willing. Only we do not know with our ordinary consciousness the realities that live in feeling and willing. Have you ever heard anyone say, "If you shiver, that means someone is walking on your grave?" Or it means that a ghost is trying to get your attention? In a recent movie "Ghost Town" whenever the living spirit of a dead person (a "ghost") walked through a person, or vice versa, the person sneezed. Another movie, "In the Electric Mist", portrayed a Confederate army camp, and a general who appeared to Dave Robichaux and advised him throughout the movie. Other movies comes to mind, such a "Ghost", "Milagro Beanfield", and "Ironweed" in which ghosts make their presence known to characters in the movie by various means, but only we as viewers of the movie can witness them. In the movie "Dedication" the ghost of his illustrator returns to a writer of children's books, and as soon as the writer is ready for a real relationship with a woman, the ghost jumps out of sight to allow the writer to finish alone. We as audience are in effect given clairvoyant vision of the full spiritual reality while the characters of each film are limited mostly to feeling and will. Often the lead characters are called schizophrenic or crazy because they are reacting to a reality that other characters do not share. [page 24] If we could live through the reality of the feeling life, and especially the reality of the willing life, just as in waking we live through the reality of the sense perceptions and the thought conceptions (the conceptions to a lesser degree), then those who have died would be just as much in continual connection with us as someone who is with us here on the physical plane, and we would be able to receive impressions from the dead in our waking consciousness through our senses and thought life. What is living in the impulses of the dead juts continually into our feeling life and into the life of our will impulses, and only because we miss it by dreaming and sleeping through it do we feel separated from the dead. Most of the world we experience does not exist for the spirits who live in our world. We can experience with our sensory perceptions the lowest level of the physical world of minerals and plants up to all the higher animals and humans and the impulses within them. For the spirits, all the mineral-based materials and life-forms extending into most plant life are invisible, and the lowest level they can experience comprise the impulses or forces living in animals and humans. [page 25] This is the lowest world for the dead in exactly the same way that the mineral world is the lowest world for us here in the physical body. Just as for us the plant world sprouts forth and builds itself up out of the mineral kingdom, so for the dead the human world builds itself as a soul world out of the foundation of the animal world. And just as the animal kingdom forms the third category for us based upon the mineral and plant world, so the kingdom of the angels, archangels, and so on, forms a higher kingdom for the dead. The living spirits we mistakenly call the "dead" live in a world where everything they do causes pain or joy. They operate on feelings the way we operate on minerals and things. For example, in this world we break a rock or hammer a nail into a tree without thinking about any pain the rock or tree might feel. [page 26] If we knock on a table, we feel that it does not cause the table pain. The dead can never carry out an action without knowing that they live and weave not only in a living element, but also in a living element filled with feeling. The feeling-filled stimulus is spread out over their entire environment. [page 26] Even among Anthroposophists I have found that not everyone always prefers to leave roses on the bush, although the feeling has already progressed so far that no one has ever presented me with a bouquet of nightingale heads at a gathering! Here we begin to feel how the life that expands within us continues on into our surrounding world. The living spirits (the so-called dead) have access to information that we living in the flesh do not. Steiner says that "learn to know this world from all sides through having to penetrate step-by-step all the secrets that here on Earth are concealed from them". This should bring up the question in every thinking person, "Why?" Why are these things and processes kept secret from us? Why is there a curtain thrown over our ability to access this knowledge and these abilities while we live in the flesh? As you can imagine the answer to this question has been known, but kept secret over the ages, primarily for the protection of humanity from itself until the time was ripe for them to possess the knowledge and have the abilities. [page 28] If you gain the knowledge of what is related to the animal nature in the world of the dead, you then see that all this is the feeling-filled living element. Human beings also have this feeling-filled living element in their souls, but in what way? Between birth and death (for that is where it exists) they possess this element in such a way that, were it not locked up in their unconsciousness, they could at every moment employ it for the destruction of the remainder of this living element in the world. Just imagine what that really means. You have in your personal life a, feeling-filled living element that is enclosed in the boundaries of the physical human being. If human beings were generally to have this element freely at their disposal, then they could employ these concealed forces at any time to destroy the feeling-filled living element around them. [page 29] In this connection, there is an important difference between life after death and life here on Earth. The life here [on Earth] has concealed by a veil just what the dead must deepen in themselves. We perceive the world through our senses and form for ourselves certain laws that we call the laws of nature, according to which we then build our mechanical instruments and tools. What we erect around us according to the laws of nature is essentially a world of death. We must even kill the plant, even the tree, when we wish to place its wood at the service of our mechanical arts. And again it belongs to the most distressing knowledge that basically everything that our senses teach us, when we apply it by means of our will, is something destructive and cannot be anything else but destructive. One can now understand the mystics of India who go out of their way to step on the smallest ant — that veil has not covered them and they have greatly restricted what they can do in this lifetime to keep from harming any living thing. Steiner will reveal later (See Page 80 quote) the boon to the elemental world which occurs when living things are destroyed and unable to reproduce. It was not in my consciousness when I wrote my essay, Art is the Process of Destruction, that any work of art involves destruction of some living thing. My focus was on the destruction of the sameness which exists at the time when a new form of art comes into existence, and how this newness represents an input from the spiritual world. But Steiner makes it clear that any art work, any artificial representation by a human being, involves the destruction of some living materials in the process of its creation, so we can see that art is the process of destruction at an even deeper level than I had envisioned in my original essay. [page 29, 30] Even when we create a work of art we must take part in the world of destruction. What we thus create first arises out of destruction. A beneficent world wisdom has only caused us at first to shrink back, as human beings, from placing what lives — from the animal world upward — at the service of mechanical art. In a certain higher sense, however, everything lives in the world. You will already realize this from the various accounts given over the years. But what do we actually do when we place what we perceive through our senses and combine through our intellect at the service of mechanical art? We continually carry death into life. Even a Raphael painting cannot come into being unless death is carried into life. More was living before a Raphael painting arose than after it came into being. In the universe this is compensated only through the fact that souls come who enjoy the Raphael painting and receive from it an impulse, an impression. In the long run we are all dead, as the saying goes, but rightly understood, even the Earth will die — as our physical bodies die, so will the physical Earth die. This is a natural part of the evolution of the cosmos as described in Steiner's An Outline of Occult Science. [page 30] Essentially, the Earth will be destroyed, because human beings carry death into the Earth in such strong measure through their mechanical arts. The Earth will no longer be able to live, because the forces of death prevail over what can be saved from the destruction of the physical Earth and carried over into the Jupiter stage. But out of what human beings have created by weaving together death and life, they will have regained a soul content that they will then carry over into the Jupiter(5) existence. We meet a new person and something in that person enlivens us, some soul condition in that person makes us feel more alive — this is something we have all felt during our lifetime. But there are times when we feel this way and there is no new person around us to whom we can point as the source of this feeling. What do we do in those cases? We will attribute our good feeling to the weather or some external condition. What if that feeling came from a living soul which is not present in a body, but is hovering around us? How would that soul feel if its salubrious presence were attributed to the weather? [page 31] Through our relation to a certain soul, regardless of whether it dwells here upon the Earth or in the spiritual world, we feel that we become inwardly strengthened: our inner forces become stronger and at the same time more alive. We meet a soul and feel that it makes us more awake than we would have been otherwise. An intimate sense of life streams toward us with a certain intensity through our acquaintance with this soul. Not all souls enliven us; some may weaken us, but the important thing is to notice these effects when they occur out of the blue, and not remain as if asleep to their presence. In the movies I cited above, the presence of the souls to humans in the flesh came about only under extreme conditions, as though these humans had to subjected to extreme conditions in order to receive the guidance that they would have otherwise continued to ignore from souls trying to help them. [page 31] We live out our life of feeling and will as human beings between birth and death, without knowing that the souls of the dead live in the waves of this life of feeling and will, which we sleep through and dream away. The dead are always there. They live in the waves of our own feeling and will, and they live there in such a way that they experience this life with us. While we experience the surrounding world through our senses as something external, the dead live in the impulses of our feelings and will. They are far more intimately bound together with us than we, as far as we are physically embodied, are bound together with our surroundings. Here's a specific example of an impulse of feeling and will which weaves into a person's destiny. This kind of thing happens to us all the time, but only in such salient events as these do we become aware of it(6). [page 35] Someone has the habit of taking a daily walk; it leads him onto a mountain slope. He goes there every day — it is his special pleasure. One day he goes there again as usual. Suddenly, while he is walking, he hears something like a voice (although it is not a physical voice) that says to him: Why are you walking along this path? Can you really not do without this pleasure? He hesitates and turns aside, to think over what has just happened to him. In this instant a piece of rock rolls down that would have struck him had he not turned aside. Everyone reading the above true story will be aware of the impulse which lead the man to hesitate and may think, "Oh, that could have come from a living spirit." But did you notice that the "special pleasure" could also be an impulse from a living spirit? You can learn to become sensitive to these impulses, both the salient ones and the subtle ones, both the ones which happen and the ones which do not happen, as shaping your destiny. [page 36] We feel that here a different world order is at work when someone is prevented from continuing his walk, because he hears a voice that causes him to turn aside and thus saves him from being struck dead by the falling piece of rock. But this world order always permeates our existence, not merely when such sensational events take place. Even in such instances we are accustomed to looking only at the sensational occurrences. Why do we not notice this other world? Because we turn our gaze toward the events that occur in our life and in our surroundings, and not toward the events that do not occur, to the events that are continually being prevented. You might be thinking, "I'm not clairvoyant, of what use is this material?" At the beginning of his next lecture, Steiner gives his audience a summary of the material covered above — this should make sense to you because you have read some of the details above already. And he points out that clairvoyance is unnecessary to make the spiritual world alive to us. [page 37] As an introduction I will touch briefly upon a few facts we have already discussed, as a foundation for today's discussion. I said that the threshold between the usual physical world of the senses and the soul-spiritual world lies within the human being. It lies within in such a way that in our usual waking consciousness between birth and death, we are really awake only in our sense perceptions, and in the thoughts we develop — whether based on our sense perceptions or arising within us — to make the world intelligible and alive for us. Even a very ordinary self-reflection teaches us (clairvoyant endowment is not necessary for this) that when usual human consciousness is fully awake, it cannot embrace more than the sphere of the life of ideas and the sphere of sense perceptions. We also experience in our soul the world of our feelings and the world of our will, but only in the way we live through a dream. Our dream life extends into our ordinary waking consciousness, and as feeling human beings we are actually dreamers of life. Things occur in the depths of our feeling life that we have no knowledge of in our waking consciousness, in our ideas and sense perceptions. The waking consciousness knows still less concerning the real processes of our will life. We dream away our feeling life in our ordinary consciousness, and we sleep through the life of the will. Thus, beneath the life of our thoughts lives a realm where we ourselves are embedded and that is only partly known to us; it is only known to us through the waves that break the surface of our consciousness. This is a fishing metaphor, as anyone who has gone fishing will attest. There are fish underwater, but unless one of them swims close enough to the surface of the water to cause waves to appear, we are not sure there is a fish. These events such as the questioning voice causing the man to pause and miss the falling rock was like a wave breaking through the surface of consciousness. One does not need clairvoyance in order to develop a consciousness of our belonging together with the living spirits, the "souls of the dead" which surround us. They are ever present, both in our sleeping at night and in our awaking life during the day. Steiner considers it his task and that of his spiritual science to help all humans develop an awareness of their presence. [page 38] We have emphasized further that in this realm where we dream and sleep, we live together with human souls passing through death and a new birth. We are only separated from the so-called dead because we are not able to perceive with our ordinary consciousness how the life of the dead, the forces and actions of the dead, play into our own life. These forces and actions of the dead continually permeate our feeling life and will life. Therefore we live with the dead. And it is indeed important to realize that the task of spiritual science is now to develop this consciousness of our belonging together with the souls of the dead. In this next passage Steiner explodes the convenient fable which we call history, up until now. This fabulous view of history only accounts for the portion of the movie film of life which is illuminated and ignores completely the dark space between each light frame we call sleep. Only when the effects of these dark spaces in which the so-called dead play are taken into considerations can we have a complete view of history. [page 38] It is not for nothing that during the course of the public lectures I drew attention to how the historical course of life — what human beings live through historically, socially, and in the ethical relationships with people- really is like a dream, like sleep. The impulses that we develop when we go beyond our own personality, and that are active within the human community, are impulses of dream and sleep. People will consider history in quite another way when this has reached their living consciousness. They will no longer consider as history the fable convenue that is usually called history today, but will realize that we can understand historical life only if we seek what is dreamed away and slept through in ordinary consciousness, and into which the deeds, impulses, and actions of the so-called dead play. The deeds of the dead are interwoven with the feeling and will impulses of the so-called living — that is actually history. How can we relate to the so-called dead, those living spirits of our dearly departed which live among us? We can read to them. They will especially be able to benefit from the thoughts of spiritual science. The process called "reading to the dead" is simplicity in itself: One holds an image of the person in mind and reads. No special training is required, no clairvoyant powers, just the intention to do and the action of thinking of them as you read. [page 39] The thoughts of spiritual science, the ideas that we form about the processes in the spiritual world, are thoughts that are intelligible both to us on Earth and to the souls of the dead. Out of that comes what we call reading to the dead. When we read precisely the contents of spiritual science to the dead while holding them in our thoughts, we form a real community of life with the dead. Spiritual science speaks a language common to both the souls of the living and of the dead. There is a curious inversion which goes on when communicate with the dead: what you hear yourself saying is actually coming from the living spirit of the dead person, and what you hear them saying in reply is coming out of yourself. Exactly how this works is a puzzle to me, but somehow it feels right. I expect this will require a lot of meditation in order to make sense from it. Below is how Steiner describes the process. [page 40] Please understand this clearly. When you read to so-called living people, you know that they understand what you read to them, but the dead live within the contents of the words themselves. The dead live in each word that you read to them. They penetrate into what passes through your own mind and soul [Gemüt]. The dead live with you, more intensely than was ever possible for them in the life on Earth. If we understand this fact, we can develop community with the dead. This community with the dead is really a very intimate one, intensified by a seeing consciousness. If we enter consciously into the realm we inhabit together with the dead, when you read or recite to the dead you hear what you are reading from the dead person, like a spiritual echo. We must become acquainted with ideas like these if we wish to gain a real conception of the concrete spiritual world. Things are different in the spiritual world than they are here. Here, you can hear yourself speak when you are speaking, or you know that you are thinking when you think. If you speak to or begin a thinking relationship with the dead, your words or the thoughts you send come to you out of the dead themselves, if you consciously perceive your connection with the dead. And when you send a message to the dead, you feel as if you are intimately connected with the departed person. If a reply comes, at first you are vaguely conscious that the departed one is speaking, and you must now draw out of your own soul what has been spoken. This will make you realize how necessary it is for a real spiritual communication, to hear from the other one what you yourself think and conceive, and to hear from out of yourself what the other one says. This is a kind of inversion of the entire relationship between one being and another, but this inversion takes place when we really enter the spiritual world. An example of someone learning from the dead is portrayed in the recent movie, "In the Electric Mist". A Confederate General appears to and speaks wise words to Dave Robichaux. We can understand that the words which the General spoke to Robichaux arose from Robichaux's own soul. [page 57] Here on Earth you can hear yourself speaking to other human beings — you hear what you tell them, and you hear what they tell you. When you communicate with the dead, their words arise out of your own soul, and what you tell them reaches you like an echo coming from the dead. You cannot hear what yo tell them as something coming from yourself; you hear this as something coming from them. The living spirits of the dead require time to become accustomed to the spiritual world; first, they commune with the animal kingdom, then with human souls karmically connected to them, and then with the hierarchies of the angels, archangels, and above. We as humans proceed from the mineral, plant, and animal kingdoms, but as living spirits in our time between death and a new birth, we feel carried by the angelic hierarchies. 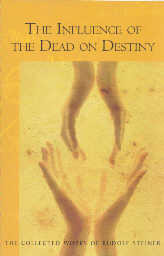 [page 41, 42] The dead become accustomed to the spiritual world just as we become accustomed to the physical world in the life between birth and death. While the deceased become accustomed to the lowest region relating to the animal kingdom, and to the second region where companionship arises with those souls karmically connected (either directly or indirectly) to them, they also become familiar with the kingdom of the beings who stand above the human being (I say this figuratively) with the kingdom of the angeloi, archangeloi, and archai. . . . As we feel, in a certain sense, that the human being proceeds from the mineral, plant, and animal kingdoms, so the deceased feel themselves held and carried by the hierarchies above them. [page 54] Here we have deep inner lawfulness! Everything is built up on rhythm. We breathe in a threefold way, or at least, we are placed into the breathing process in a threefold way. First, we breathe through our lungs in the region of the elements; this rhythm is contained in the number 25, 290. Then we breathe within the solar system, by taking sunrise and sunset as parallel to our falling asleep and awaking. Throughout our life we breathe in a rhythm that is again contained in the number 25,920. Finally, the cosmos breathes us in and out, again in a rhythm determined by the number 25, 920 — the Sun's course through the zodiac. Above is a drawing of a heliocentric view of the cosmos. Notice how the star field represented by the astrological signs of Pisces, Aries, Taurus, and Gemini form a sphere immediately surrounding the spheres of the planets which surround Earth: Moon, Mercury, Venus, Sun, Mars, Jupiter, and Saturn. Curiously, the Sun is included as a planet, along with the Moon. The positions of Mercury and Venus are seemingly out of order, but that is due to a name change of the two planets between ancient times and now. Now, look at the lower diagram as drawn by Rudolf Steiner and included on page 58 of this book. 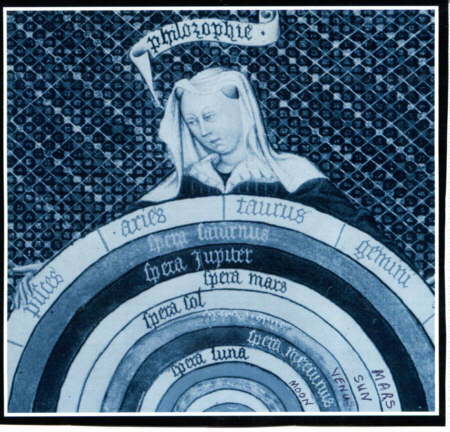 In his diagram, we see the planets as objects and the starry field as a sphere which surrounds them. The first diagram is like a navigation chart for the newly deceased human explorer entering the spiritual world and expanding through the planetary spheres from Earth: first one begins at the sphere of the surface of Earth, then expanding to the sphere of the Moon, and thus through the planets to the starry realm. The second diagram shows the view from an explorer who has passed the starry realm and is looking back on the cosmos: one sees each of the planetary bodies through one of the twelve constellations(7). Physicists who try to comprehend quantum effects in terms of the physical world get a little dizzy because they lack a physical interpretation for such effects as the collapse of a wave function in one edge of the universe affecting quantum objects in the other edge of the universe. Their reaction is similar to the way people feel when they try to imagine the spiritual using their spatial concepts learned from physicists. [page 67] Often we human beings become ill because we try to imagine the contents of the spiritual world spatially, even though as something nebulous or misty. We want to think about it spatially with souls flying about in space, and so on. We must go beyond the ideas of space and time to more complicated ideas, if we really want to penetrate into these things. Allow yourself to stretch your concepts of space and time and imagine yourself in the spiritual world in which you exist outside the universe looking into our cosmos as if you were a fortune teller looking into a crystal ball(8). The planets act like vowels and the zodiacal constellations act like consonants through which the spiritual explorer reads the text of the cosmos at any moment. [page 58] Between death and a new birth, we use the stars as a kind of text. Let us make this really clear. How do we read here on Earth? We have approximately twelve consonants and seven vowels with various variations. We arrange these letters in many ways into words. Think how a typesetter mixes the letters together in order to form words: all the words consist of the specific letters that we possess. For the dead, the fixed stars of the zodiac and the planets are what letters are for us here on the physical plane. The fixed stars of the zodiac are the consonants, and the planets are the vowels. Between birth and death, we see from the center outward to the periphery. Beyond the starry heavens, the dead see from the periphery. It is most difficult of all to imagine that things are reversed after death so that we see from the periphery, that we are really in the circumference and see the stars of the zodiac (the consonants) and the planets (the vowels) from outside. We look from outside at the events taking place on Earth. Depending on which part of our being we enliven, we look down on the Earth through Taurus and Mars, or we look through Taurus in between Mars and Jupiter. We must not picture this from the earthly standpoint, but reversed, for we are looking down onto the Earth. When we are dead and circle around the Earth, we read with the help of the starry system, but we must picture this kind of reading differently. The type of reading Steiner describes which is done by our spiritual explorer is a type I have seen in several movies; one was "A Beautiful Mind" where letters lighting up in random pieces of text arrange themselves to form words and meaning in John Nash's mind. [page 59, 60] The dead read in such a way that, with the aid of the starry system, the fixed stars remain immobile but the dead themselves move. The fixed stars remain still and the dead move around. If they are to read Leo above Jupiter, they move around in such a way that Leo stands above Jupiter. The dead connect the stars, just as we connect h and e, in order to read "he." This reading of earthly conditions from the cosmos, to which the invisible cosmos belongs, consists in this: that the dead can read what lies spiritually at the foundation of the stars. Cause and effect — where would our natural science be without cause and effect? We take it for granted that every effect has a cause in our world. But our world is a world in which our perceptions provide us a mirror image reflection of the real world and when we observe, for example, a fight between three people, A, B, and C, reflected in a mirror, we can believe there are people in the mirror fighting as the mirror is only reflecting what is happening outside the mirror. Rightly understood, all cause and effect in our physical world is like images in the mirror interacting — the real cause lies in the spiritual world, not in the maya of the reflected world we perceive with our sensory apparatus. We are like the men in Plato's Cave arguing about which shadow caused the other to move and why. The convenient fable we call history is exactly such an exercise in futility which it ascribes causes and effects. [page 61] If you believe that A there in the mirror, or the reflected image of A, does something to B there within the mirror, you are quite mistaken. You cannot set up relationships and connections between the reflected images, but you can only say: what is reflected in the mirrored images points to something in the world of reality which is reflected. Yet our sense-perceptible world is a mirror, a maya, and in this world people speak of causes and effects. When they speak of causes and effects in this world, it is just as if they were to believe that the mirrored image A beats the mirrored image B. Something happens among the real beings, reflected by the mirror, but the impulses leading to the fight cannot be found in the mirrored A and in the mirrored B. Investigate nature and its laws and you will find, at first, what appears to your senses, a maya, a reflecting element, or a mirrored image. The reality lies beneath the boundary that I have indicated to you, the boundary between the life of thought and the life of feelings. Even your own reality is not contained at all in your waking consciousness; your own reality is contained within the spiritual reality that submerges the dreaming and sleeping forces of feeling and will. Thus it is nonsense to speak of a causal necessity in the world of maya, and it is also nonsense to speak of cause and effect in the course of history! It is real nonsense! The last subject Steiner takes up in Lecture 4 is that of freedom. Freedom comes from pure thoughts, direct inputs from the spiritual world — not from the passions, desires, and instincts which drive us and from which only unfree deeds can result. These drives arise from the maya of the world around us and do rise to the full capability of the human being which is to act in freedom out of pure thoughts. Pure thoughts could be taken to mean morally clean thoughts or thoughts arising from the spiritual world directly, but deeper consideration would show that these two meanings name a distinction which in fact does not exist. [page 62] . . . the waking reality embraced by our thoughts and sense perceptions only contains illusion or maya. This maya cannot be the real cause of anything. However, pure thoughts can determine our actions. This fact can be experienced, if we are not led to deeds by passions, desires, and instincts, but by clear thoughts. Pure ideas can be the impulses of human actions. Yet ideas in and of themselves cannot accomplish anything. I can carry out an action under the influence of a pure idea, but the idea itself cannot do anything. In order to understand this, compare the idea with the mirrored image. The reflection in the mirror cannot cause you to run away. It must be that it displeases you, or something is there that has nothing to do with the reflection in the mirror, if you run away. The reflection in the mirror cannot take a whip and cause you to run away. This image cannot be the cause of anything. When human beings fulfill actions under the influence of their reflected image — i.e., their thoughts — they fulfill them out of maya; they carry out their actions out of the cosmic mirror. They are the ones who carry out the actions, and for this reason they act freely. However, when they are led by their passions, their actions are not free; they are not free, even if they are led by their feelings. The idea that humans can only act freely and independently when guided by pure thinking was the thesis of Steiner's landmark work titled The Philosophy of Freedom(9). We are indeed free because we live in a world of maya and maya, like reflections in a mirror cannot cause us to do anything, only passions, desires, and instincts activated by a mirror reflections might cause us to act, but that act would not be a free but a compelled act. [page 63] We unite our being with maya and thus become free beings. If the world we perceive were a reality, this reality would compel us and we would not be free. We are free beings just because the world we perceive is not a reality, and for this reason, it cannot force us to do anything, just as a mirrored reflection cannot force us to run away. The secret of the free human being is the understanding of the connection of the world perceived as maya — the mere reflection of a reality — and the impulses coming from human beings themselves. We must ourselves give the impetus to action if we are not induced to action by something influencing us. Freedom can be proved quite clearly, if the proofs are sought on the basis that the world we perceive is a mirrored reflection and not a reality. One of Steiner's basic teachings is that the human being consists of a physical body, an etheric or life body, an astral body, and an "I". We have both feelings and will, but we dream away the contents of our feelings and sleep away in dreamless sleep the contents of our will. Our feelings and will operate, but mostly out of our awareness. If one wants to get an idea of one's feeling life, one pays attention to the feeling state in which one awakes each morning from dreaming, those feelings blend over into our nearly awake reality and are revealed to us. Why, you may wonder, do we remain so little conscious of our feeling and will? [page 66] Through our feelings and through the contents of our will, we dive into the world in which we live together with the dead, among the beings of the higher hierarchies-the angeloi, archangeloi, archai, and so on. As soon as we live in a feeling (and we live constantly in feelings) everything in the kingdom of the dead lives with us in this sphere or in the realm of feeling. The sphere of our "I" is the least known and therefore the most misunderstood, especially by our natural scientists. Our "I" is the newest and least developed of our four bodies — the physical(10) is the oldest, followed by the etheric and astral. We speak of our "I" but we do not experience in it in our ordinary consciousness because of its will-like nature. [page 66, 67] When clairvoyant consciousness penetrates into the true being of the "I," it will find that it has a will-like nature. What we have in everyday consciousness is only an idea of the "I." This is why it is so easy for experimental psychologists to deny this "I," even though this denial is really nonsense. These scientists and psychologists say that the "I" develops gradually and that human beings acquire this "I" in the course of their individual development. Human beings do not acquire the "I" itself in this way, but only the idea of the "I." It is easy to deny the "I," because for everyday consciousness it is merely a thought, a reflection of the true, genuine "I." The real "I" lives in the same sphere as the true reality of our will. And what we call our astral body, what we designate as the actual soul life, lives in the same sphere as our life of feelings. If you bear in mind the things we have thus considered, you will see that we dive with our "I" and our astral body into the same region that we share with the dead. When we penetrate clairvoyantly into our true "I," we are also among both the "I"s of the dead and the "I"s of the so called living. Our "I" matures at a slower rate than the rest of our body, one-fourth the rate. This means that a woman of twenty-eight years old has an "I" which is only 7 years old. What we call the age of majority or 21 is the barest beginning of the growth of the "I" in a person, and this is the earliest age we in the USA entrust various privileges to our young adults, among them drinking and voting. In our outer appearances we give the impression to others that we are four times as mature as we really are when our "I" development is considered. [page 70] This means that during our development as human beings between birth and death we are only a mere semblance of a reality: we make the impression of being four times as clever as we really are. All we possess, in addition to this one-fourth, we owe to what holds sway in the historical, social, and moral work within the world where we dream and sleep. Dream and sleep impulses, which we have in common with the universe, seethe up above the horizon of our being, fructify this one-fourth part of our understanding and soul, and make it four times as strong as it really is. In effect, this insight reveals that three-fourths of me say that I am not free at any one time, and only one-fourth of me, my "I", says that I am free, but unless I focus in pure thought on some decision, the one-fourth which is free will have its voice drowned out by the three-fourths which is driven by passions, desires, instincts and the opinions of other people. [page 70] Here is the point where illusion arises concerning human freedom. The human being is indeed a free being. However, only the real human being is free. Only the one-quarter part that I just described is a free being. Other beings play into the remaining three-fourths; therefore these parts cannot be free. From this arises the delusion regarding freedom that causes us to continually ask if human beings are free or not. They are free when the idea of freedom is connected with that one-fourth of their being. If human beings wish to have this freedom as an impulse of their own, they must develop this one-fourth part in a correspondingly independent way. In ordinary life this one-fourth part cannot assert itself, simply because it is overpowered by the other three-fourths. Our desires, appetites, emotions, and passions are active in the remaining three-fourths. These slay our freedom, for what is contained in the universe in the form of impulses works through these desires, emotions, and passions. A moral imagination, as Steiner called it in his Philosophy of Freedom, is the opposite of the mirrored reflections sent us by physical reality, and is composed of real impulses of Imagination, Inspiration, and Intuition. If we cannot, as most people today, perceive the moral imagination directly, it appears to us as mere fantasy. [page 71] When we do not know that these impulses are active, but only receive what they bring about into our ordinary consciousness, it then looks like a fantasy. And these results of moral imagination — these incentives to action that do not lie in desires, passions, and emotions — are free. It should be clear to the right thinking person that one does not need to be clairvoyant to attain moral imagination, but certainly if one is clairvoyant, one comes to it consciously. But that has not stopped humans from achieving great things through moral imagination which is the mainspring of human progress because it is a fountain from which springs all that is new in the way of ideas, inventions, and art. [page 72] A human being who is not clairvoyant can also develop moral imagination. All real progress for humanity has always proceeded out of moral imagination, as far as this progress developed within the ethical sphere. The point in question is that we first develop a feeling, and then an enhanced feeling (we shall hear immediately what is meant by enhanced feeling) that we are not merely here on this Earth to accomplish things concerning us personally or individually, but also to accomplish things that allow the will of the time spirits to be realized. In the year 1879 Michael became the time spirit for our time, and under his influence we will participate in changing the contents of human teaching. Steiner said on page 72 that "At present only ideas dealing with nature are conveyed even to the most educated people; what is imparted to people regarding ethical and social life is in most cases an unreal, schematic abstraction." Already in the middle twentieth century, concrete ideas about ethical and social life have arisen from concrete and experiential reality through the life of Andrew Joseph Galambos. He formulated his ideas which give an experiential basis for freedom which anyone can understand and adopt as one's own. The result will be in future generations, a powerful combination of ethical and social life for all humans, in which morality will grow and flourish from his science of volition. A new idea of what constitutes history will also have to arise. I found such a new concept of history in the writings of J. R. Collingwood in his book, The Idea of History. He said, among other things, "All history is the history of ideas." It is a statement which impressed me immediately, long before I had any hint of Steiner's concept of moral imagination, from which one could deduce that ideas are the seeds of what come to fruition in what we can rightly call history. Unfortunately, we are yet stuck in a time in which mostly "cadaver-history" is taught. Steiner describes cadaver-history in a way that we can know that much of what is called history is cadaver-history, up until now. [page 73] There is nothing more senseless than to recount history by describing, for instance, the deeds of Napoleon at the beginning of the nineteenth century, and then assuming that the events after Napoleon's exile are the consequence of Napoleon's actions. Nothing is more senseless than this! For what one can tell about Napoleon signifies exactly the same for reality as the description of a human corpse three days after death signifies for the dead person's life. What is now called history is a "cadaver-event" compared with reality, even though this cadaver-event has a great importance in the minds of many people. Steiner discusses the natural growth of a plant and how when it reaches maturity, one might attach wires to the tips of the branches and add paper flowers to the wires to make the plant bigger or more impressive. Who would do such a thing to a plant? Look around in public places, amusement parks, and people's homes and you will find the wired branches and artificial flowers completely replacing the entire plant. Historians and prominent people of all political persuasions are also prone to such artificial extensions of the plant we call history. [page 76] Such wires do indeed exist where historical events are concerned. While historical events should long ago have adopted another course, such wires are there instead-except that in historical development these wires are human prejudices and human indolence, which continue to maintain, on dead wires, what has died long ago. Certain people place themselves at the ends of these dead wires (in other words, at the outermost ends of human prejudice) and these people are often considered true historical personalities. And people do not realize how much these personalities sit on the wires of human prejudice. One of the most important tasks of the present is to begin somewhat to judge how many personalities who are looked upon as great individualities are, in reality, merely hanging on the wires of human prejudice. One of the beautiful results of the old conundrum about which came first the chicken or the egg is that it reveals the limited nature of our concepts of cause and effect. The chicken cannot be both the cause of the egg and the effect of the egg, and yet the reality of the situation requires it to be so. Whenever our natural science would like to elevate cause-effect to the throne of a scientific law, there is the court jester chicken-egg blocking the way. [page 77] The materialistic conception would actually like to eliminate the concept of free will. It would also like to interpret the events taking place in the course of history in the same way that it contemplates scientific matters: namely, that a preceding cause always produces, with a certain necessity, something that follows it as an effect. This next topic is one that I have pondered a lot. It has to do with the one million salmon eggs which are laid by a female salmon to produce only a few salmon — what a shame to have all those eggs die without becoming a salmon. One can extend this thought to the wheat we grind into flour which will never produce another wheat plant, etc. Here is a cause, a wheat seed, which will never produce an effect, a wheat plant. Steiner explains it simply: some causes do not produce effects, at the least they do not produce the lived-out-completely effects we would expect from them, like the unfertilized salmon eggs. [page 78] Every year a great number of life germs develop in the ocean-seeds or embryos that do not become living beings. The life germs, or eggs, are laid and most of them perish. Only a small part of these grow into real living beings. This, of course, does not only happen in the wide ocean but also in the whole of nature. Consider how many life germs are supposed to become living beings, even in the short space of one year! How much is meant to become alive and does not attain life, when eggs are laid that do not develop! We could say that all these germs of life contain causes that do not produce effects. Indeed, anyone who considers nature in an unprejudiced way — will find that there are countless things in nature that must be designated as causes, although they do not produce the same effects as when the causes live themselves out completely. There are countless instances where life is interrupted, so to speak, and does not attain its goal. What do spiritual investigators see when the eye of their soul sees such repressed processes of life? (page 79) We see eggs and seeds which die, but if we could dream in a cosmic sense we would see these apparently dead life-germs contributing to the elemental or pre-life forms which fill the world around us. But we mostly dream egotistically in our day-time consciousness and this awareness escapes our notice, up until now. [page 79] When we connect with our surroundings and at the same time develop the forces we develop in dreams, we experience imaginative thinking. We can experience consciously through imaginative thought what is kept back in the processes of nature and does not reach the stage of physical living beings. Beings arise from such repressed life germs that are only accessible to imaginative thought. We could dream of them if we dreamed as beings belonging to the hierarchy of the angeloi, instead of as human beings. In fact, if I may use this expression, the angeloi dream of the beings that are simply the products of the life germs that have only apparently perished, rising up every year in great numbers from the sea and the earth as elemental forms. This insight provides us another example of something we have felt bad about based on our limited cause-effect reasoning which was an unnecessary waste of effort. Instead of feeling bad, we could with a cosmic-dreaming consciousness experience a spiritual fragrance arising around us in the elemental world. We would come to realize that when life-germs en masse are killed, the spiritual world receives a benefit it would have else not received. I just this moment squashed a female mosquito about to extract some blood from my arm in order for her to reproduce. By interrupting the life-germs of future mosquitos in her body, I have released them into the elemental world. [page 80] In the grains of wheat and in other products that we use for our food, we interrupt the progressive process. We do not allow the life germs to become real beings, but through our own existence we cause what was destined for something else to become an elemental process that can be seen only through imagination. But the reality that lies at the foundation of this imaginative life takes place because we ourselves are placed into the process and participate in it. From the grains of wheat, from everything else in nature that we consume in this way, an elemental life arises that permeates us. We take up this elemental life and are within it. We have here the foundation of elemental life. We can exist, so to speak, only because we interrupt another progressive process and spiritualize it. Even when we eat, we spiritualize a process that would otherwise take a purely material course. Every birth is a wonder. Every work of art is a wonder. Every scientific discovery is a wonder. Every poem is a wonder. Every un-caused effect is a wonder. Every act of free will is a wonder. 1) Every birth is a wonder. [page 83] No human being who enters the physical world from the spiritual world and proceeds to a physical incarnation is a physical necessity. Human beings are a necessity only in that they themselves determine this necessity, because they have made the super-conscious decision in the spiritual world to connect themselves with a certain hereditary stream. The cause does not lie in father and mother — they merely provide the opportunity. The appearance of every human being in the physical world is a miracle; a wonder. 2) Every work of art is a wonder. [page 83] Think how much Goethe occupied himself with scientific thoughts and how exemplary his scientific ideas are. He had, as you know, a constant longing to go to Italy. And when he finally saw the great works of art in Italy that gave him a conception of the creative, artistic activity of the Greeks, he wrote to his friends at Weimar: "Here is necessity; here is God." He wrote of a necessity not rooted in natural science. He could have had a sense of that [natural-scientific] necessity from his previous scientific work, but he instead sensed the necessity that shines from the spiritual world and is the same as the wonder or miracle. 3) Every scientific discovery is a wonder. The postulation of and later disconfirmation of Bell's Theorem is a wonder. Einstein himself predicted that the world could not operate the way a disconfirmation of Bell's Theorem would predict. 4) Every poem is a wonder. This begs to be answered by a poem, and I wrote one about 1990 called, "Wonderfull Answer." 5) Every un-caused effect is a wonder. [page 85] One may say that in perhaps five years, human beings will recognize that they should have listened to many things, and they might already have known many things if they had listened at the right moment. But they are not inclined to hear these things — they only like to hear things that are visible in the outer physical world. But this physical world has no significance for the historical course of events. It does not show the impulse, the motive force behind events. What is to be the starting force and impulse for events in social and ethical life must come out of the spiritual world. 6) Every act of free will is a wonder. [page 86, 87] The conclusion we must come to is that, in accordance with what lies before us, we must confess that we cannot find Christ Jesus if we seek Him in an outward historical way. We must find Him through spiritual investigation — this is how we shall surely find Him and the historical event at Golgotha. Why? It must be this way because the historical event at Golgotha occurred in the course of human development through freedom of will — in a much higher sense than is the case with other historical events — and because human beings must accept its validity through inner freedom. Events that can be proved historically cannot be accepted freely. Events that have no outer historical proof are accepted for spiritual reasons, and on a spiritual foundation we are free. We become Christian through freedom, and in our modern age we must understand, above all, that we can be Christian in a real sense only through complete freedom and not through the compulsion of historical documents. What Steiner says about his relationship to Goethe in the passage below remarkably matches my own relationship to Steiner, for the same reasons he gives. I have friends who ask me if I have read other authors who write about spiritual science and about Rudolf Steiner's teachings, and I stumble to find a way to explain to them why I mostly shun other authors. I usually say, "I haven't finished reading all of Steiner's works," but my real answer would be, after reading the passage below, "Steiner says far better what he says then anyone else could." [page 87, 88] I was always of the opinion that we really do not need to repeat what Goethe said, because Goethe himself said what he wished to say far better. It is always better to read Goethe's own works than the opinions of schoolmasters, even when they are such excellent schoolmasters as, for instance, Lewes, who wrote the famous Goethe biography. What I tried to write is based on the inspiration of a Goethe who is no longer on the Earth — the continuation of his ideas in a certain sphere after death. I wrote what could be written out of a certain feeling of a living relationship with the so-called dead. I mention this as an example and indeed not out of conceit and vanity, but because it is connected with the question of what human beings must do to become more receptive to what comes from the spiritual world. In this next passage, Steiner describes how governing bodies will eventually listen to the living spirits (the dead) in making their decisions, but it will take a long time. In the insightful 2002 movie, "Minority Report," a world of the near future is depicted in which a governing body used intuitives who were kept in a dreaming state in a tank from which they reported crimes about to happen. The police who monitored these pre-crime reports were then dispatched to prevent the crime from happening, arresting the person before the crime. [page 89] The dead know, more than the living, what must happen socially, but human beings living on th physical plane must listen to them and be the instruments carrying out the knowledge of the dead. Modern human beings must learn above all to become instruments. But such "parliaments" (if I may use this unpleasant expression) where human being will strive to let the dead also be heard will not exist for a long time to come But no well-being can come in certain spheres unless the dead are consulted, unless social life is spiritualized also from this direction. Before believing that the knowledge gained here on Earth through birth, the world, and school is ripe for social impulses, we should penetrate into what has really become ripe for social impulses, we should penetrate into what has really become ripe for social impulses: the wisdom of those who have already laid aside the physical body, a wisdom that can reveal significant points of view if we really investigate it. 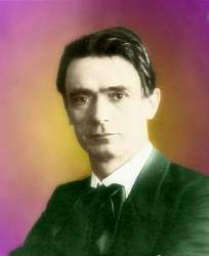 By pointing out how movies today are already being made which describe the principles of Rudolf Steiner in action, I hope to make people aware of the far-sightedness of this man who spoke these words almost a hundred years ago, and whose ideas are being taught in the only kind of adult education which reaches a large majority of our population in the twenty-first century, the movies. In this next diagram from page 98 of the text, Steiner draws as a vertical line a memory wall which constitutes what I have called the Memory Transition Age in the science of doyletics. If one labels the yellow circles as doylic memories and the red circles within the U-shape as cognitive memories, one will have laid out the basic theory of doyletics, which is that before the Memory Transition Age (of 5), all memories are stored as doylic memories (bodily states only) and all memories stored after the MTA are stored as cognitive memories (just plain memories). [page 98, 99] Let us suppose that you are facing the world with all your organs of perception and understanding. This will give you a conceptual and perceptive content of a most varied kind. I will designate the consciousness of a single moment by drawing different rings or small circles. You know that a memory process takes place when you look back over events, though in a different manner than modern psychologists imagine. The time into which you can look back, to which your memory extends, is indicated by this [vertical] line; it really indicates the place that here reaches a blind alley. This would be the point in your third, fourth, or fifth year, which is as far back as you can remember in life. Thus all the thoughts and pictures that arise when you look back upon your past experiences lie within this space of time. Let us suppose that you think of something in your thirtieth year, and while you are thinking of this you remember something that you experienced ten years ago. If you picture very vividly what is actually taking place in the soul, you will be able to form the following thought: If I look back to the point of time in my childhood as far back as I can remember, this constitutes a "sack" in the soul, which has its limits. Its curved end is the point that lies as far back in my childhood as I am able to remember. This is a sort of "sack" in the soul; it is the space of time that we can grasp in memory. Imagine such a "soul sack" into which you can look while you are looking back in memory — these are the extreme limits of the sack that correspond in reality to the limit between the etheric body and the physical. This boundary must exist — otherwise (to picture it roughly) the events that call forth memory would then always fall through at this point. You would be able to remember nothing; the soul would be a sack without a bottom, and everything would fall through it. Thus a boundary must be there, an actual soul sack must be there. But at the same time this soul sack prevents you from perceiving what you have lived through outside it. You yourself are non-transparent in the life of your soul, because you have the faculty of memory. Note the apparent difference between the way I described memories and Steiner described memories. The two descriptions describe the same process, as I will explain. I wrote above, "all memories are stored as doylic memories before the MTA and all memories are stored after the MTA as cognitive memories." There is an overlap of several years, specifically the two-year span of 3, 4, and 5, during which some memories are stored as doylic memories and some as cognitive memory. Steiner described the "wall" which I call the MTA thus: "This would be the point in your third, fourth, or fifth year, which is as far back as you can remember in life." It is during this two year period that our neocortex is learning to store cognitive memories and when a cognitive memory is stored, the doylic memory of the event is no longer retrievable because the cognitive memory always arises when one tries to recall the original event of the memory, if it exists. If no cognitive memory of a pre-MTA event exists, the doylic memory always arises(11). The process of keeping a doylic memory in mind, i. e., holding a doyle, is the key to doing a speed trace, and the process is described by Steiner in this way, "We can begin by trying to keep before us in meditation, with more and more accuracy, something we can remember, until we feel that it is not merely something we take hold of in memory but something that really remains there." (Page 99) Since doylic memories can last from its pre-MTA storage point for the rest of a person's life, it is clear that doylic memories can be something permanent. Doylic memories, however, can also be something temporary because it is possible to do an unconscious speed trace to convert them into regular memories, which typically happens to our food dislikes by age of 40 to 50 years old. Few people report having food dislikes after those ages, in my experience of helping people do speed traces. Converting a doylic memory into a cognitive memory does not remove the doylic memory, but merely adds a cognitive memory which thereafter arises when the stimulus occurs which would have previously called up an unpleasant bodily state (doylic memory). By my analysis and hypotheses, doylic memories are permanent and cognitive memories of previous doylic memories are also permanent, and both are stored in the etheric body. In the final chapter, Steiner discusses "Intellectuality and Will — The Necessity of New Forces of Knowledge" and what he said in 1917 in this lecture applies equally well or more so today, almost a hundred years later. Let's read what he called "intellectuality" and see if you and I agree that it applies to humanity today. [page 109] As you know, if we want to understand the most important characteristic of the present time, we must realize that our time suffers from a superabundance of intellectuality. However we do not mean to say that humanity is especially bright today in comparison with earlier ages. I mean that the various soul forces of today's human beings are inclined toward intellectuality. And because we live in a materialistic age, intellectuality is employed exclusively to interweave the human soul and material existence. Our intellectuality in the present age is not very high, because it is almost exclusively directed to compiling, arranging, and summarizing (if I may be so pedantic) material things and material manifestation. In a certain sense, this intellectuality rules alone within the human soul. It's as if we were looking at someone and saying, "He's smart, but not all that smart" because we perceive that he's using his intellect in ways that are beneath him. How is humanity using its intellect in a way that is beneath it? By using it without the forces of will and love. Human intellect without will and love is like canned computer software today — the smartest software money can buy has no freedom to act on its own or to love. In the field of artificial intelligence we find people claiming that computers will one day be smarter than people, and in that statement one can see the overweening intellectuality of our time has greatly exceeded that of Steiner's time. [page 110] What must be added is something that, if really understood, cannot be intellectual: the human will. It is the human will permeated with love, in the way I described the human will in connection with the impulse of love in my Philosophy of Freedom. Human will manifests itself in the subconscious realities of our drives and desires, whether they are egoistic desires, social desires, or political aspirations. All of this remains unconscious or subconscious. If the will, which we dream away or sleep through, is raised into consciousness as we showed in recent lectures, then this view of the will can no longer be materialistic. The fact that the so-called most important minds of our time question whether human freedom actually exists shows us that the will is not understood in our time. If we do not understand the will, we do not understand the full human being. We would be like naturalists who study plants without ever taking notice of their underground roots which are often as big as the plants, but since they lie out of sight, are often ignored. Humans are living and willing beings, and the willing is like our human roots, lying out of sight in our unconscious, sleeping away in the land of living spirits (the dead), unnoticed by our materialistic intellectuality, up until now. Human beings reside, like plants, equally above ground in the world of materiality and below ground with our roots in the world of living spirits. Natural scientists investigate the former and ignore the latter at their peril. [page 111] Our time must begin to ask, as a human destiny question: how must the view of the human being develop when taking to account the fact that as feeling and willing beings we exist in the same world as the so-called dead, and are alone among the living only with our sense perceptions and intellect? And we must add to the inner soul impulses working with this question a real will to understand concretely the life of human beings between death and a new birth. For without an understanding of the life of the disembodied human being, it is impossible to develop an understanding for the task of the human being within the physical body. Does nature ever take a leap forward? Given that human beings are hardly considered to be a part of nature in the twenty-first century, I doubt whether the leap forward that Steiner considers here would qualify in most naturalists's eyes. I drew on page 112 the figure below to represent the leap forward during the fifteenth century using my delta-E to represent an evolutionary jump in the evolution of consciousness. I'm reminded of a famous cartoon showing a scientist explaining a large set of calculations on a blackboard to a fellow scientist. He points to a gap in the equations and says, "And here, a miracle occurs." We could point to the fifteenth century and say that. My figure show that a miracle occurs in the life of the plant when suddenly the energy that went into making leaves is funneled into making a beautiful flower, a flower bearing seeds, without which the plant is doomed to die forever. It is only by such a metamorphosis that a plant can survive from one generation to the next. One doesn't have to be reading Rudolf Steiner for very long before one encounters this criticism of him, stated in various ways, "He only rehashes an ancient gnosis." Steiner eschews any kind of rehashing, whether it be of the New Testament or of gnostic writings. In his Gospel Lectures, he read them only after he had familiarized himself with the events of Christ Jesus' time and there is definitely no "warming up" or rehashing of ancient writings in these amazing lectures. His Fifth Gospel reveals events in Christ Jesus's life which is not recorded anywhere. As for gnostic writings, Steiner has pointed out that the gnostic writings were destroyed in the early centuries of the Church replaced by gnostic writings composed by opponents of gnosticism. Any one who studies Steiner's body of work objectively will immediately notice that he does not base his writings or lectures on the work of other people, but his own research. When his writing on the evolution of the Cosmos in which we live matches up with ancient writings, it is because there is an objective spiritual world in which we live, which evolved in only one way, even though there may be many ways of describing that evolution. Steiner uses modern terms to replace sesquipedalian esoteric names of theosophy, but renaming for clarity does not equate to plagiaristic rehashing of the type he is often accused of by his virulent critics, both in his own time and now. His arguments which reveal the baseness and lack of understanding his contemporary critics reveals the similarity a century later to critics in the twenty-first century. One wonders at the fear which would entice them to attack a seeker of the truth — it can only be that the truth lies deep within them, and what they seek to hide they must advertize to all, which is the way of all psychological repressions. So they attack in Steiner what exists within themselves, but which they refuse to acknowledge, up until now. [page 112] Now, you must not misunderstand me. I cannot in any way, in accordance with all the requirements of anthroposophically oriented spiritual science, promote warming up old things. The talk of the need to rehash old books and old views, that is so prevalent in the world today, cannot be done in our arena of anthroposophical spiritual science, because we must obtain directly from spiritual life itself what must be revealed today, and because something significant is being revealed for those who receive it. He offers us the example of Basilius Valentinus as the most renown adept of the fifteenth century. Historians cannot understand Valentinus' writings today because they view his work as antiquated alchemical rantings and deem them of no use in the present day. Rightly understood, alchemy was a way of prepared knowledge and skills required after death while one is alive in the flesh. We must face this task ourselves, and ridiculing alchemy instead of understanding its true aim will not help, and so Steiner helps us by unrevealing the mystery of alchemy. [page 112, 113] If we read something by Valentinus with a real, spiritually trained eye, we very quickly discover that his works contain a kind of wisdom that is indeed not useable for modern people who have the typical interests of today. This wisdom is of the kind that we can bring into connection with the souls between death and a new birth. Also the dead do not need to study Valentinus, for we have something in anthroposophically oriented spiritual science that speaks the language common to the living and the dead. What this spiritual science gives is enough to speak with the dead in a way familiar to us. Yet, I bring this as a historical fact that the way the dead take up world knowledge has a certain kinship with such writings as those of Valentinus. He speaks of all kinds of chemical processes: he appears to speak of what one does with metal and other materials in retorts and melting pots. In reality, Valentinus speaks of the knowledge that the dead must attain if they are to nurture their processes in the lowest realm, which for them is that of the animal. He speaks of what one must know of the impulses coming from the spiritual world to grasp the microcosm from out of the macrocosm. This is the knowledge-activity of the soul between death and a new birth, but it can be performed properly only if it is prepared in life between birth and death. This was still present as an atavistic inheritance, as an inheritance of ancient wisdom, in the fifteenth century — Valentinus speaks of this ancient wisdom, of the secrets of the human being's connection with the macrocosm. He speaks real, divine wisdom in imaginations, as we would say today. With Steiner's help, we do not need to decipher all the abstruse writings of Valentinus, but prepare ourselves to meet the forces we require to cooperate with the living spirits (of the dead) at work in our world. [page 113, 114] This way of relating to the cosmos in knowing has disappeared in recent centuries, but must be attained again in a more spiritual way than was the case before the fifteenth century. For it must be practiced both in science and in socio-political life, and it must be recognized that a wholeness, or healthy state of humanity, is possible only under the influence of such goals. An ancient revelation, an ancient inheritance, came down through the centuries, so to speak, but was lost in the fifth post-Atlantean epoch. It must be attained again in a new way. We can attain this revelation (as we have discussed repeatedly) only by permeating ourselves actively and willingly with the Pauline "Not I, but the Christ in me. "We can attain it only if we call upon the forces proceeding from the Mystery of Golgotha, so that after taking these forces into our own soul, we search in the cosmos with them. And only thus can we meet the dead who work among us. Otherwise, we will be separated from them for the simple reason that the plane of the physical world that we grasp only with our intellect and sense perceptions can never bring us into any kind of connection with the dead. There are groups around the world today who are attacking Rudolf Steiner and his teachings yet today, like Max Dessoir and Gerhardus Bolland did in his own day. His remarks about the Dutch philosopher Bolland could be aptly applied to Steiner's critics in the twenty-first century who cannot "avoid applying their non-productiveness to making all kinds of false statements about our spiritual science." (Page 115) The organization known as PLANS, who claim to be critics of Steiner-based Waldorf Schools, reveals its bias in its very acronym, People for Legal and Nonsectarian Schools. The word "sectarian" implies that somehow the Waldorf School system is run by or part of a religious sect, which is a blatant lie. One wonders why a group would go to such lengths to criticize a school system which is private and voluntary. One must admire the way they focus their non-productivity! Steiner warned of such attacks upon his work over a hundred years ago. [page 115] However, we must prepare ourselves for the fact that slanderers and libelists such as Dessoir and Bolland will appear again and again, and that they will soon increase in number. These people have to busy themselves with something! And because they are much too comfortable to go into what must be learned from the spiritual world for the well-being of humanity in the present age, they occupy themselves with making false statements about what is attained from the spiritual world. Perhaps one could say that they are much too uncomfortable about learning from the spiritual world because of deep-seated fears which bubble to the surface in their virulent attacks. And they are attacking the one school system which helps children grow into adults without the biases and prejudices which would prevent them from recognizing the spiritual realities of life which lie submerged under the bafflegab of our modern culture. [page 115, 116] A courageous bringing up of life impulses out of the sphere of the will is very much lacking in the present time. People today want, above all, to talk and talk! That is good, but only if it is based on a real knowledge. The present time does not want real knowledge — everyone wants to speak based on meaningless premises. And we have seen that the misfortune of our age lies precisely in this neglect of the spiritual element in the world. We are only being honest about the development of humanity if we really enter into the exploration of those will impulses that are necessary to forward the development of humanity. This is Steiner's view of our goal in the time between birth and death: Prepare for our time between death and a new birth. We in this life are not on board a cruise ship which is going to sink (as someone once said), but rather we are on board a university ship in which we learn the skills we will need in the new land to which we are immigrating, so that when we arrive we will be able to operate with the freedom we will have brought with us. Footnote 1. See passage from pages 139 and 140 of Riddles of the Soul for more details. Footnote 2. This hypothesis of mine that quantum effects lie at the boundary of the physical and spiritual worlds is elaborated in my review of Quantum Enigma. Footnote 3. 3. There is one detail which caught my attention that I attribute to the updated translation. That is the awkward phrasing of this sentence from page 14, "Then we shall know that the important point is to recognize whether a human being wills something out of himself or herself, or whether something else in him or her wills it." That was clearly not the way Rudolf Steiner said those words. Probably it was, "Then we shall know that the important point is to recognize whether a man wills something out of himself or whether something else in him wills it." The modern conceit that readers exclude women from the meaning of such a sentence is curious. "If a human being wishes to clutter up his or her writing, that is his or her prerogative" is certainly more clearly written as "If one wishes to clutter up one's writing, that is one's prerogative." I have generally found a switch to plurals useful to avoid such clutter, but frankly it doesn't work well in this particular sentence: "Then we shall know that the important point is to recognize whether human beings will something out of themselves or whether something else in them will it." In translations of earlier writings, I think it best to avoid changing the word structure to conform to modern changes in usage and would prefer a literal translation of what Steiner said in a sentence to a cluttered up sentence. Footnote 4. We see here the application of Steiner's dictum that "discussion begins when knowledge ends." Footnote 6. For more examples, see Necessity and Freedom — a series of lectures by Steiner on this topic. Footnote 7. In my review of Quantum Enigma, I postulate that the realm at which quantum particles such as photons and electrons exist when they are considered by physicists as being in a superposition state is the realm marked as "blue" in Steiner's diagram of the cosmos above. This concept removes the so-called quantum enigma and makes possible effects which seem to occur faster than light to our maya-cluttered scientific imagination, up until now. Footnote 8. As I penned this metaphor of the universe as a crystal ball, it made me aware of that is exactly what a true fortune teller uses a crystal ball for: to reveal the entire universe which holds the answers to your future. Return to text directly before Footnote 8. Footnote 9. Appearing in recent translations under the titles, of The Philosophy of Spiritual Activity and Intuitive Thinking as a Spiritual Path. Neither of the new titles seem to me an improvement over the original title, once one separates the political aspect of freedom in one's mind from the philosophical aspect of freedom, something most Americans seem unable to do. Footnote 10. The physical body is a phantom which only came to hold the minerals during Earth stage of evolution, but this phantom or form body first appeared in the Saturn stage of evolution which its substance was warmth. The etheric body first appeared in the Sun stage, and the astral body in the Moon stage. Footnote 11. Once you understand this dual-memory process, the speed trace can be understood as a simply memory technique which converts upsetting bodily states (doylic memories) into non-upsetting memories (cognitive memories).